At Buff'd we are against testing our products and ingredients on animals. 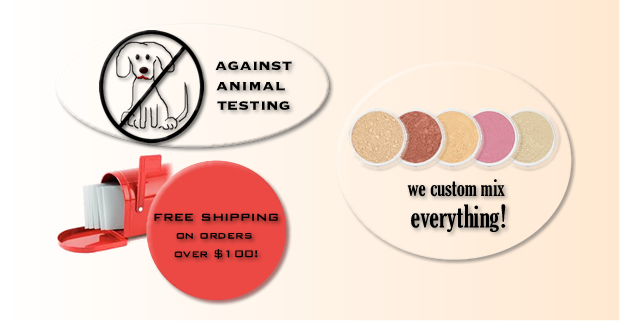 All of our products have been formulated without being tested on animals. Also, we have confirmed with our suppliers that our ingredients are not tested on animals. We offer free shipping to all orders over $100.00. This includes shipping to all areas including international destinations such as Italy and Japan. Shipping is always by Canada Post Airmail. We can custom mix any products that you like. Are you in between foundation shades? We can custom mix your perfect foundation shade and formulation. But we do more than just foundations. We can custom mix Setting Powder and Finishing Powders to your specifications. We can also custom mix blush, bronzer, illuminating dust and eye shadow shades. We have even blended foundations and illuminating dusts together for clients. If you can imagine it... we can custom mix it! Custom mixes are available in full size, refill kit size and sample size and we do not charge you extra to custom mix! Please email us if you have a mix you need formulated.